For the second layout pack of this week, Kenny and his team have created a professional Life Coach Layout Pack with 6 unique layouts. 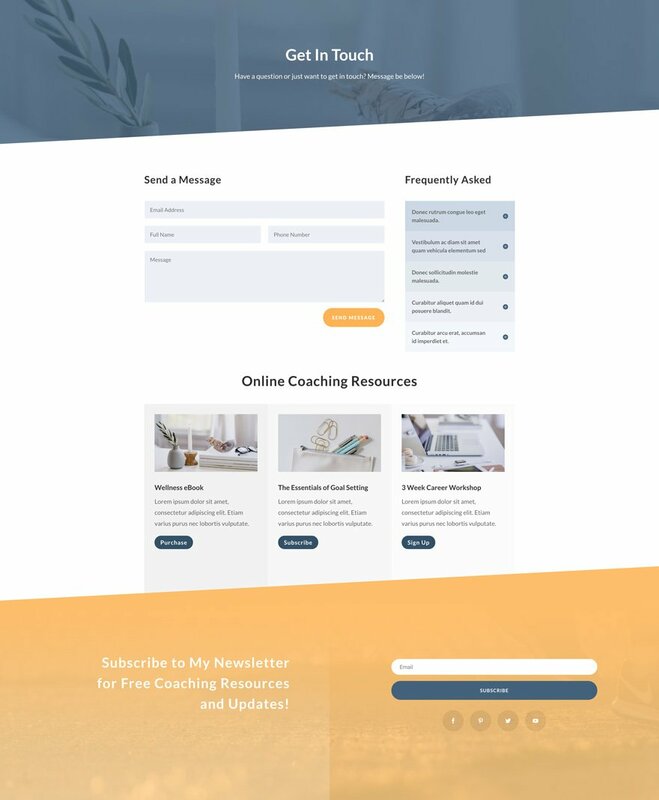 This layout pack is perfect for life coaches who want to create a website that allows them to connect with their potential clients. 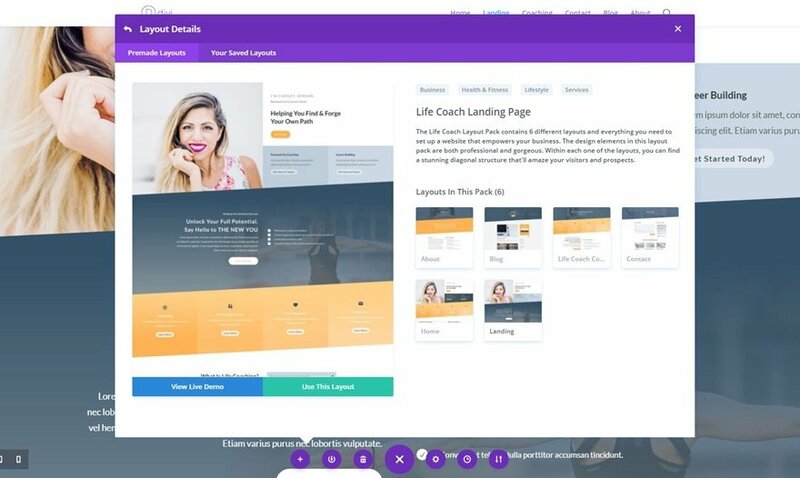 The Life Coach Layout Pack contains 6 different layouts and everything you need to set up a website that empowers your business. The design elements in this layout pack are both professional and gorgeous. Within each one of the layouts, you can find a stunning diagonal structure that’ll amaze your visitors and prospects. To access your new layout, simply activate the Visual Builder when editing a page and look for the “Load From Library” icon in the page settings bar (it looks like a plus symbol). Click this icon to launch the Load From Library popup. Under the Premade Layouts tab, you can easily find the new layout by scrolling through the list of layout packs. Once you find the Life Coach Layout Pack, click on it. You will see all the individual layouts included in the pack. Select the layout you want for to use and then click the “Use This Layout” button. Can design some layaout for web hosting companies or cloud computing companies. For sale share hosting, domains, ssl certificates and any other related product and services. If I want to use just a single section from this layout on a site which is already built, what’s the easiest work flow? Say I want to use the About Me section only. Right now, I create a new page, load the layout, then export the section, delete the page, then import the exported section into the desired page. That seems too clunky. Is there a better way? What I would do. Go to the page you’ve already built and click on “LOAD LAYOUT”. Choose the page from the layouts and add it to your existing page. This will add the about me page below everything currently on your page. Then delete everything you don’t want and then reposition the remaining section where you want it. You may have to adjust your Spacing etc depending on how you have it set when you added the new section. NOTE: when you are adding content in this way where there is existing content REMEMBER to UNCHECK the box that says “Replace Existing Content”. It’s located in the lower left corner below the main window layout. Remember too that when you added the About Us page it also added its related images to your Media gallery as well. I usually delete them if I don’t intend to use them. Thank you! I did not realize I could load a layout without destroying what is there already. I do wish we could access these layouts by section—but that’s not too important if ET would label the pieces. For the sake of basic development, each section should be labeled, right? 1. From the existing page editor, add the chosen layout pack page (say the About page). 2. The whole thing is added on your existing page after the last section you constructed. 3. Delete and/or rearrange sections as you like. 4. Modify new sections to fit. Very nice design, colors match perfectly. Three in a row that are actually pretty nice…good job ET! Looks good! But I noticed some glitchy horizontal lines that appear in the top section of the “Get In Touch” page of the demo when scrolling. Instead of loading it as new page, load it directly into your existing page. Remember to UNCHECK the “Replace existing content” box in the lower left corner below the main image window of the layouts before you click on “Use this layout”. Once done it will add the new page content below the existing content on your page. Now delete everything you don’t want and then drag the remaining section where you want it to go. You may have to adjust some setting to make it fit your layout but that’s about all. And don’t forget to delete all the images you don’t expect to use that went into your media gallery when you added the new page. Clearly I’m missing something. I like the layout but I’m having trouble figuring out which module the images are (the top one and the About Me one). I’ve tried opening up each of the modules and I don’t see any that are images. Hmmmmm this design is not sitting well with me. I give you guys two thumbs up for trying something different other than the normal design style…Keep up the great work ET Team! This is one that will be immediately usable out of the box! Love that you switched out the persona as well… Pretty easy to do, but still better than using the same person images over and over. Couple of votes for future editions: Solar Installer, Music Instructor, Instagram Influencer & Webinar. Thanks again! Hi, do you add those layouts to the “Premade layouts” inside Divi or do we have to search the blog and download them ? Am I the only one here that find these templates boring? 90% of the “style” is achieved only with use of stock images, the first thing that should be changed, and that makes very difficult (if not impossible at all) to customise them. The overall look&feel is almost the same, with very few exceptions. I mean they are good for amateur websites. But the WordPress repository is already full of free themes, I think people here is (should be) a little bit more “pro”. I would really like to encourage the Elegantthemes staff to use DIVI in a more creative way. Actually all these layouts don’t do a good job to show the versatility of DIVI. That’s interesting. Subjectivity at play here. While you may find this boring, I think ET is doing a great job with the resources they have via the builder. Especially with this one, there are a lot of subtle elements sprinkled throughout that differentiate itself from other page builders and other Divi design packs. 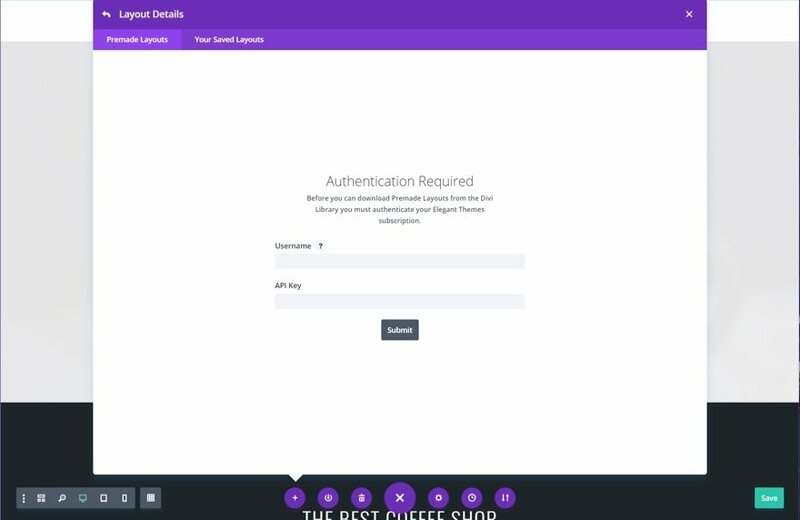 I also think they are using the builder to the maximum of its capabilities which is apparent when you try to recreate this exact layout with any other builder or even an older version of Divi. Lastly, I’m fairly sure (100%) you don’t HAVE TO use these layouts if you find them boring. So… although I agree that ET (and designers in general) should always try to improve and push the limits of what they can do, but I wholeheartedly disagree with your sentiment on the overall level of design provided by ET. It’s great that we have different opinions, huh? PS. The “stock” images are.. a. supposed to BE stock, because it’s a demo layout, and b. come directly from ET so it’s not like the images are found on pexels or anything. PPS. MY OPINION: I like what ET is doing with their layouts, and I think the layouts start off great in the proofing stage, but it’s really hard to take control of everything in the builder, and unfortunately, the responsiveness suffers due to the limitations of the builder. However, the desktop version looks great. I like this Coaching layout and I am considering using most of the layout packs to build my coaching website. Question: Could I possibly replace the photos of the model with photos of myself? Yes of course, you can customize anything about the layouts and swap out any or all of the photos that come with them. Can it at all be possible to replace photos of the model with my personal photos? Beautiful design. But I really hope that Elegant Themes can solve the divider bug soon, causing lines below the dividers. It’s been around for months now. Nice, but we need better ones than this if you guys are able to. This is awesome, but I don’t get the option to look at the premade layouts like in the video. Can you tell me how I can get those? Best layout in a while! 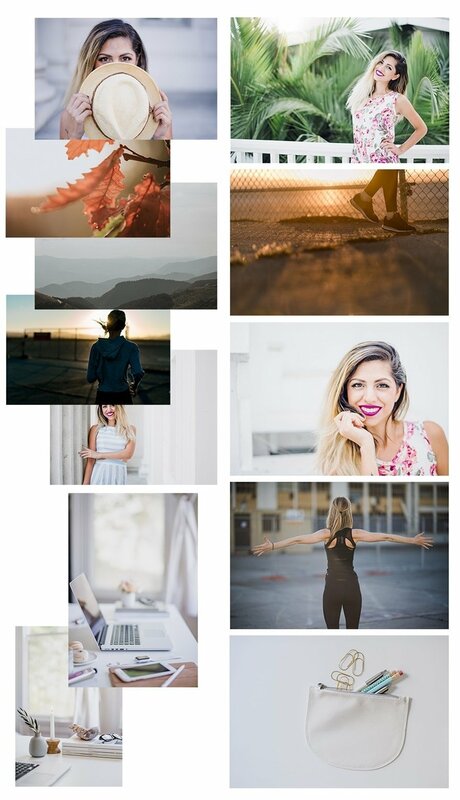 How do I make the header transparent and overlay the top image though? Like someone asked earlier, how do you change the images? Can’t find a way to replace the top image of the landing page. Thanks! I added the layout using the DIVI Building to a new page. However, the font, font color and some of the styling looks different than the demo. How can add layout same style settings? Or how can I get the style settings? Newbie question, if anyone would be so kind as to point me in the right direction? Especially with the blend/gradient effect as it seems each of the 4 text blocks are separate (as you’d expect) from each other and there some of the “band” outside of the columns. So, trying to apply a gradient (which I have worked out) is super hard to get the gradient stretching across the entire band. problem – the diagonals behave badly. this is an extremely interesting manual for this layout-pack.